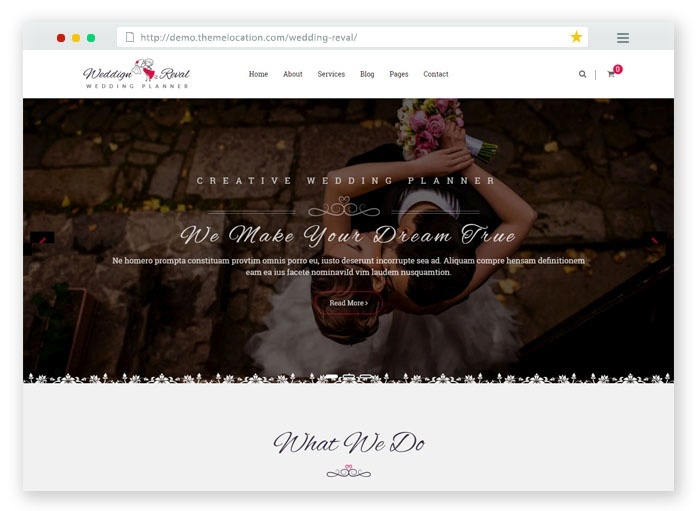 There are a lot of templates available online but for those who want handpicked templates with the features to add wedding ceremony details, bridal party, wedding photo albums etc then these HTML wedding website templates are for you. Also get the options to add story timelines, countdown timer, photo gallery, contact form and online rsvp form with these templates. Other amazing features like parallax effects and smooth animations comes integrated with most of the templates. All these website templates has responsive design for mobile support and valid HTML5 & CSS3 coding standards for better page loading speeds. Go through the following mind-blowing templates and find the template of your taste. 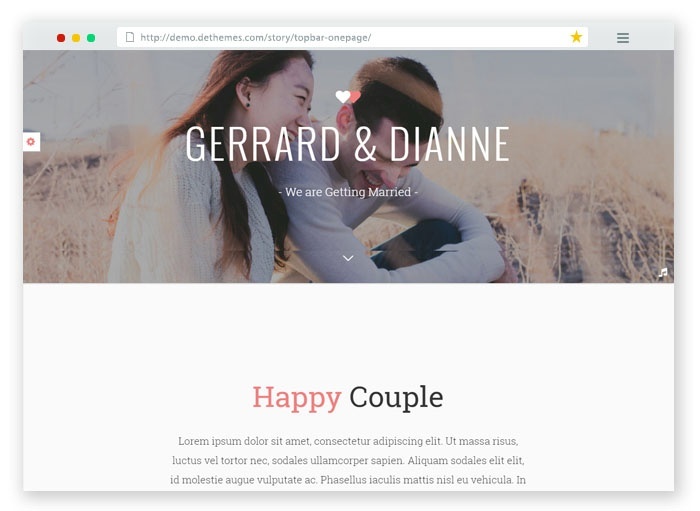 This HTML CSS template is free to use and with this awesome template you can create your wedding website. The main features of this template is that it has 2 unique versions and 4 color schemes. 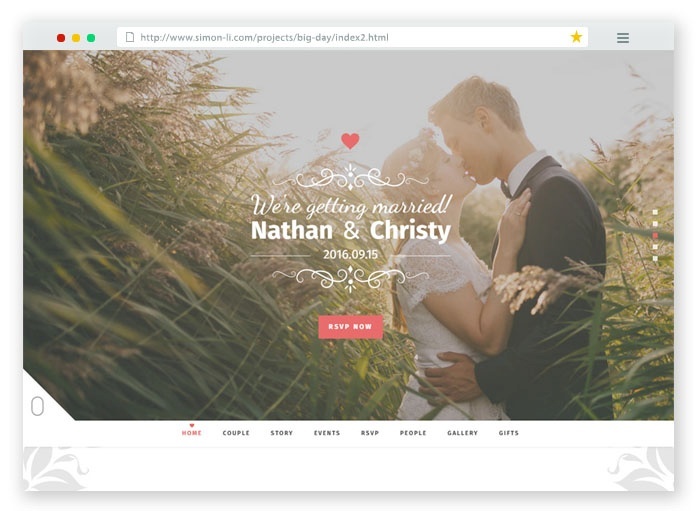 This wedding template has the latest Bootstrap and also has a responsive design for mobile devices. The template has a parallax effect that adds a unique look to your website on scroll. Other notable features of this website template are the valid HTML5 & CSS3 coding standards, PHP and Ajax contact form etc. This is a personal wedding website which has a modern and creative HTML design for your special day. 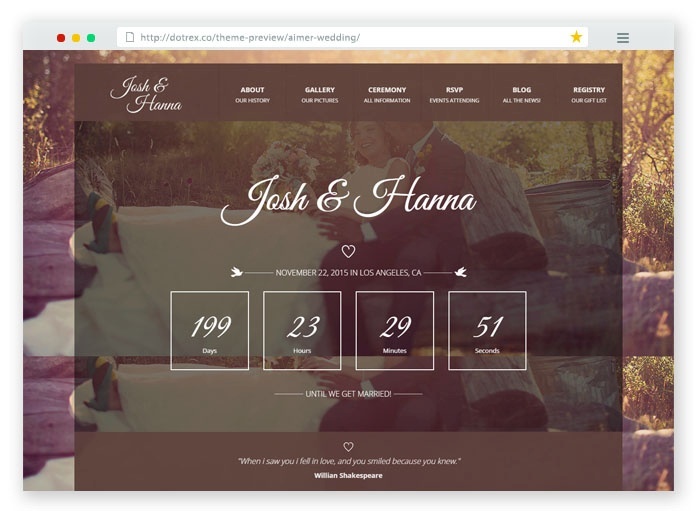 It has a wonderful user interface that will be perfect for wedding websites. This HTML template has 7 color variants to choose on and you can also create the slider with images. Creating a blog is possible with this template which you can share on social networks to your friends. This is a premium and responsive website template which is awesome to use and it has RSVP online form, photo gallery, wedding location, countdown timer etc. It supports well on mobile devices. You can also add live twitter feed script on the website by adding your twitter account on it. 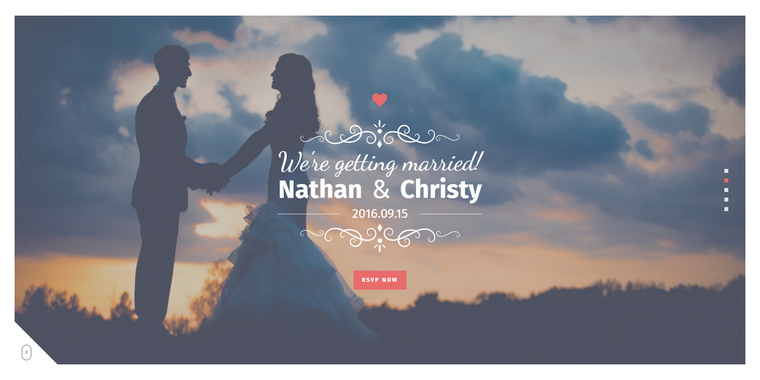 Wedding Day is a premium template which comes with 2 homepage versions and 4 color schemes. This wedding template uses the latest Bootstrap framework and it is mobile responsive. The template also has a parallax effect that adds a unique look to your website. This CSS website template has valid HTML5 & CSS3 coding standards and a PHP Ajax contact form. 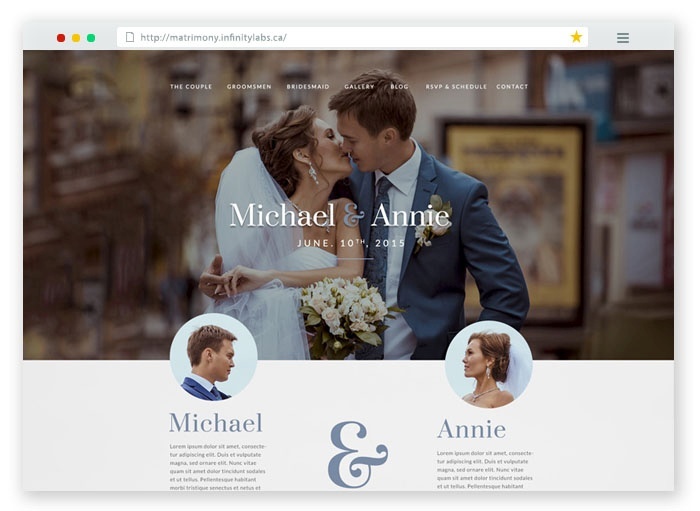 This is a premium template which lets you add high resolution photos of your wedding day and is compatible with Bootstrap 3.x framework for advanced users. This CSS template has RSPV online form, photo gallery and gift list etc. 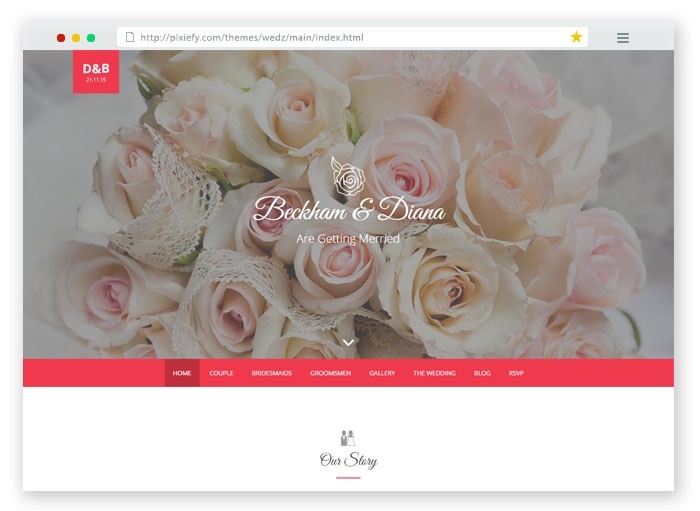 This is a premium wedding website template that comes packed with a website builder tool. 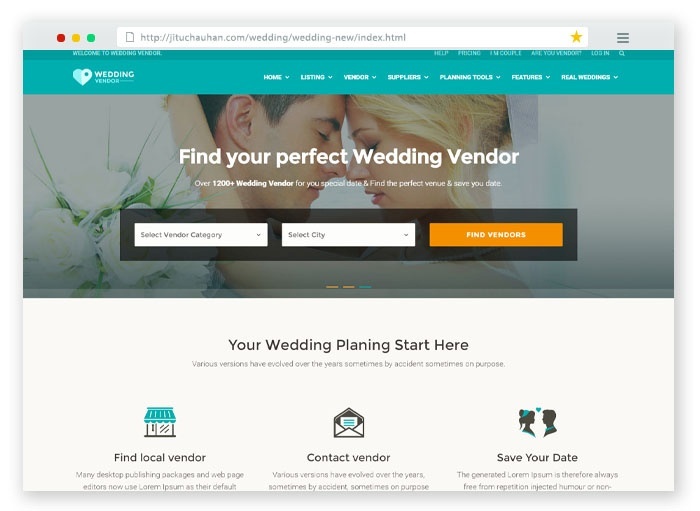 Create a unique wedding website every time using this page builder in minutes. It lets you choose from these amazing features like 4 unique headers, 5 story sections, 2 accommodation sections, 2 RSVP forms, 5 wedding sections and more. This is a responsive website template which is awesome to use. Its major features are Bootstrap 3.3.6 framework, HTML 5 and CSS3 coding standards. It has 2 styles of navigation menu and has an amazing photo gallery too. 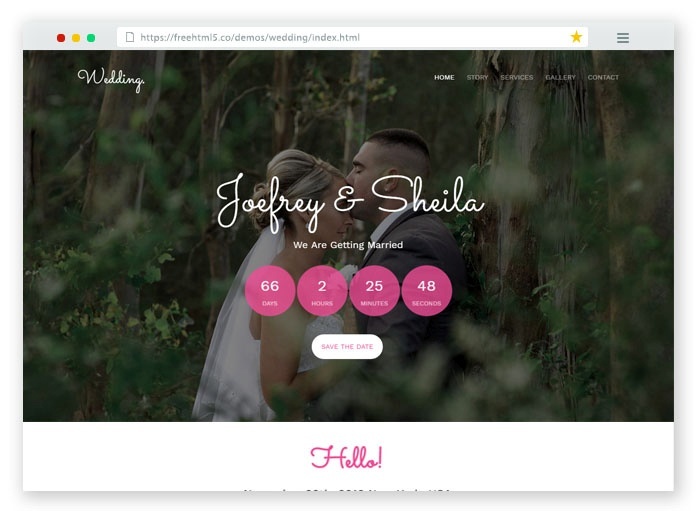 Built using Bootstrap framework and responsive design this template will help you create a wedding website for the big day. It looks great on mobile devices, tablets and even on retina displays. It has both vertical and mobile navigation and works well for wedding planners, wedding events. It has an online RSVP form to invite guests to your event. 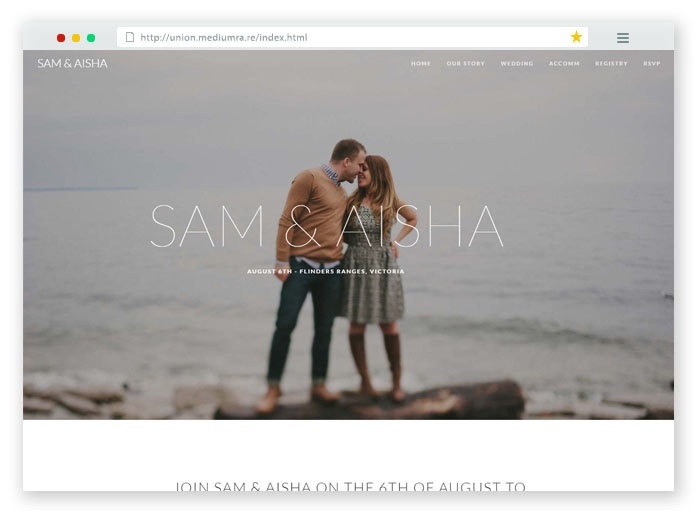 It’s a beautiful template and matches well for wedding websites. It offers different features like story timeline, countdown timer, wedding location, gift and image gallery sections etc. RSVP form is also available on this template. 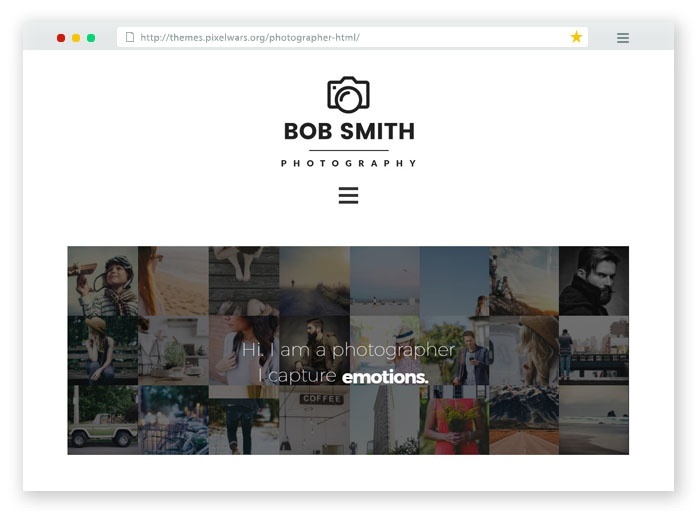 A template that serves well for wedding photographers, wedding studios and even for events as it has amazing features like showing live photo wall and photo gallery. You can also add upto 30+ social media icons for sharing your content. Ajax contact form is available and the best part is that all the post formats for the blog. This is a premium template which is simple but looks very attractive. This template has 4-page styles. The best part of this template is that it’s clean, flat and responds quickly. 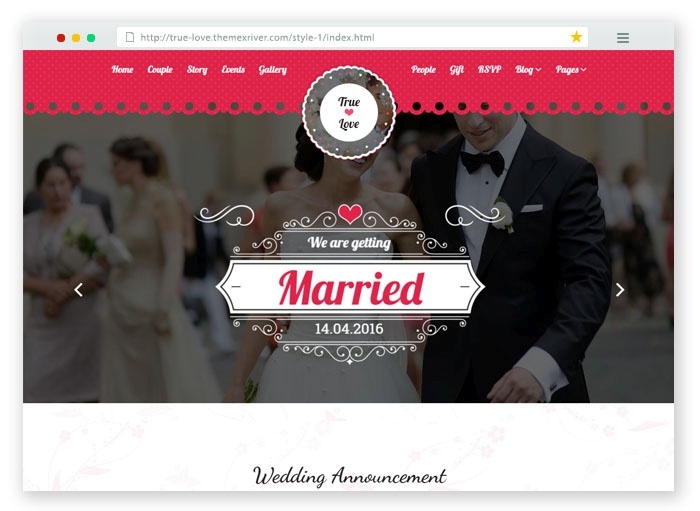 This is a responsive HTML template which is great for creating wedding websites. It is good to create blogs,wedding invitations and announcements. This template has parallax scrolling and it also has HTML5 and CSS3 coding standards. This is a which is really simple and awesome to use. It is packed with the features like Countdown timer, RSVP form, Google maps, Gift registry, Blog posts, Image gallery etc. This is a stylish HTML template designed to showcase the valuable informations of your wedding. Its major features are Story timeline, Image gallery, Wedding locations & venue, Google map, Countdown timer and RSVP form etc. This is a responsive html5 template which has different features like creating romantic story timeline, wedding event, rsvp form etc. Its design and layout is simple yet very effective. It’s font looks so different as compared to other websites. Adding couple stories, story timelines, countdown timer, location map, RSVP form on a website has never been so easy. 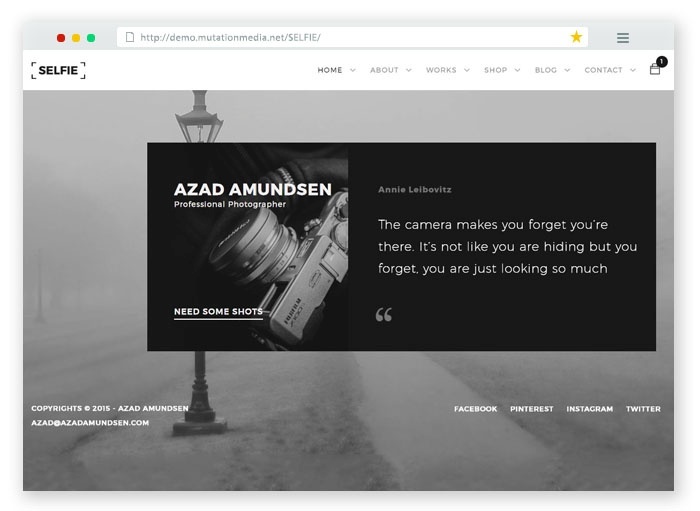 This template powers your website with these unique features and more. It also has 5 color schemes and 2 navigation menus. This is a premium and powerful template which has a creative and clean design that suits well for wedding & event websites. Other major features of this template is that it has modern UI, HTML5 & CSS3, Bootstrap framework, Slider revolution and Ajax contact form etc. 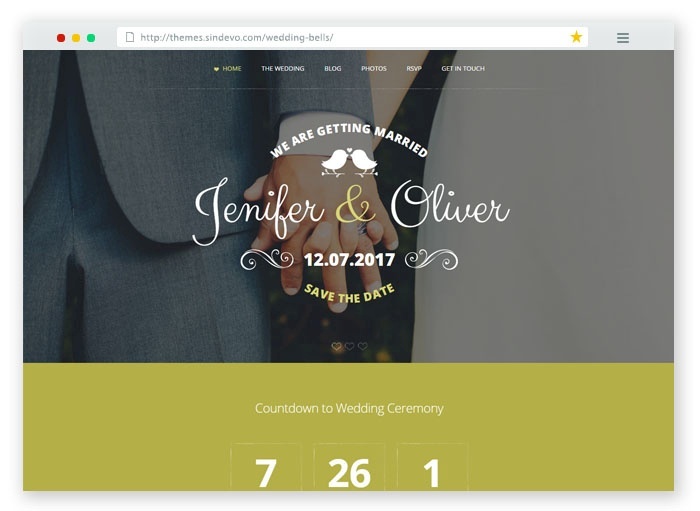 eWedding is a clean and elegant theme that comes with a lot of amazing features like Countdown timer, RSVP form, Gift registry, responsive design etc. 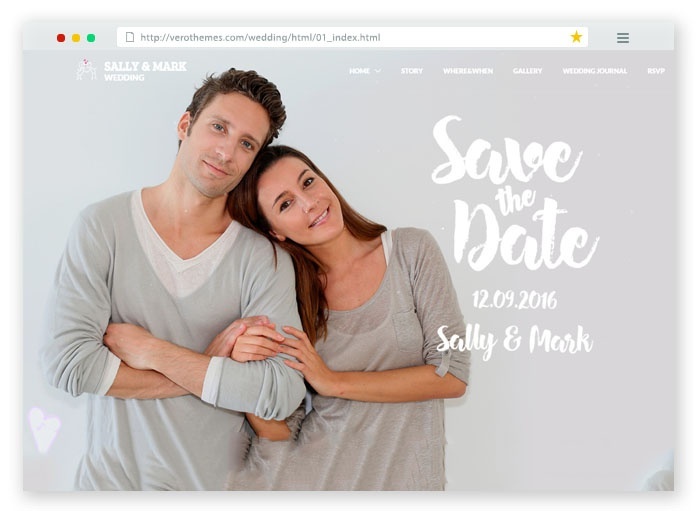 This is a good template to start creating your own wedding day website. The bold typography and clean design adds to the uniqueness compared to other templates. 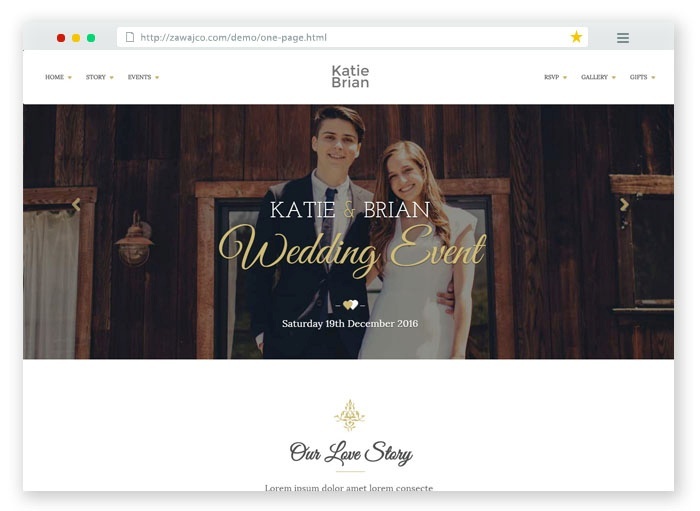 Big Day Wedding template is really good to use, fast loading, responsive and has stunning features like RSVP form, Story timelines, photo galleries to make your wedding event feel heavenly. This is a premium template with a mind blowing design and on scroll animations. 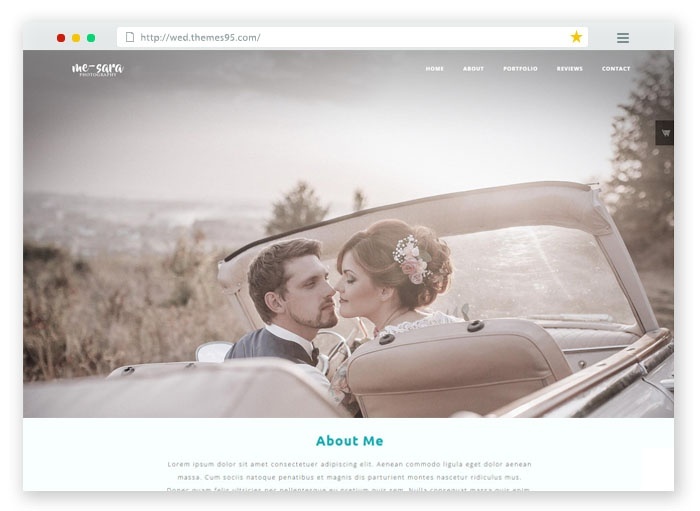 MeSara is a premium html template with amazing features like retina ready, parallax effects, online contact form, smooth scroll and HTML5/CSS3/Bootstrap etc. 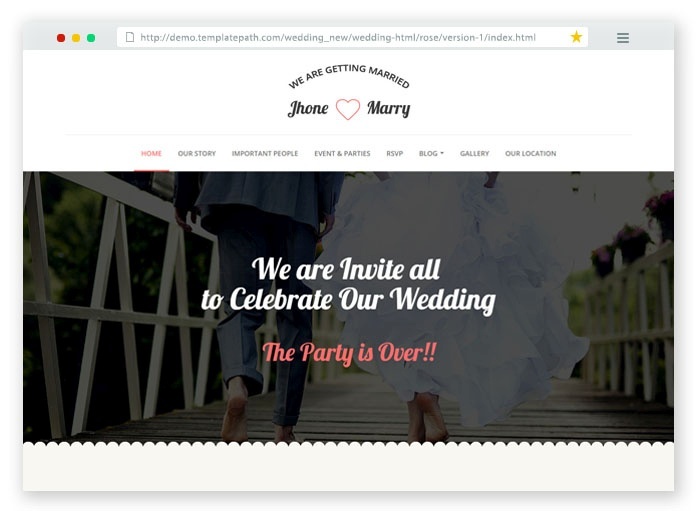 Make your wedding event more attractive with this website template and share with your friends as well. 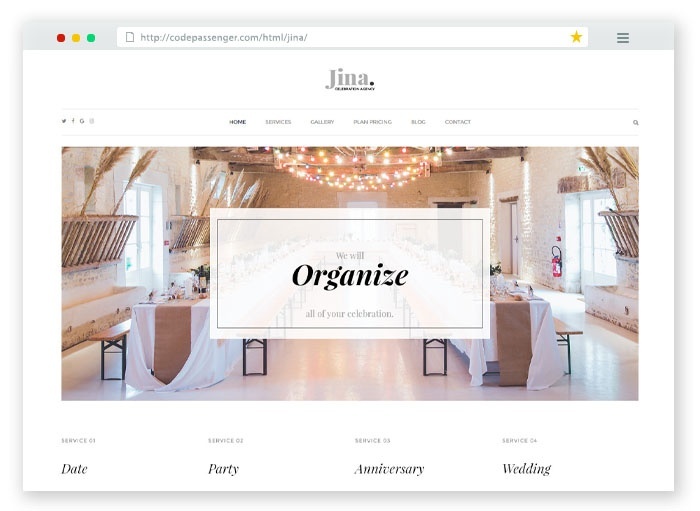 A multi-page HTML template that is awesome for wedding planners and event management. Features include Bootstrap framework, clean code, font awesome icons, professional and creative design, excellent support etc. A premium template with amazing features like valid HTML5 & CSS3, Bootstrap framework, font awesome icons, responsive design, unique looks and smooth transition effects, cross browser compatibility etc. 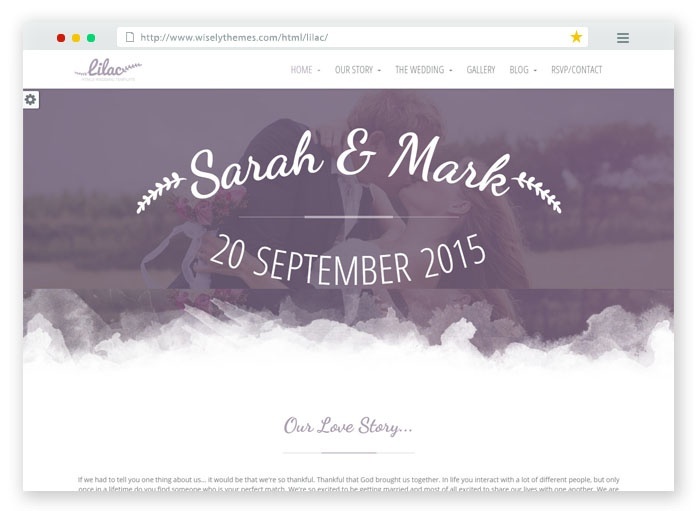 This wedding template is really great for wedding planners, wedding events etc. Want to make your wedding day event memorable ? 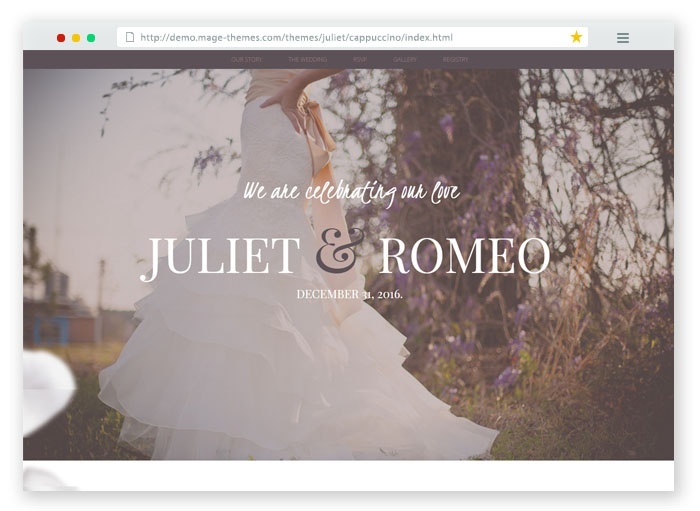 Then this wedding HTML template will help you with that. This template looks beautiful and elegant that is designed for wedding events and invitation. It has the unique features like Bootstrap, HTML5/CSS3, RSVP online form etc. Showcase the event with image galleries and also reach a wide audience by writing a blog post. This is a premium template with some amazing features for wedding planners, event managers to create, manage and update business listings. It has the features like ROW+ MAP listings. 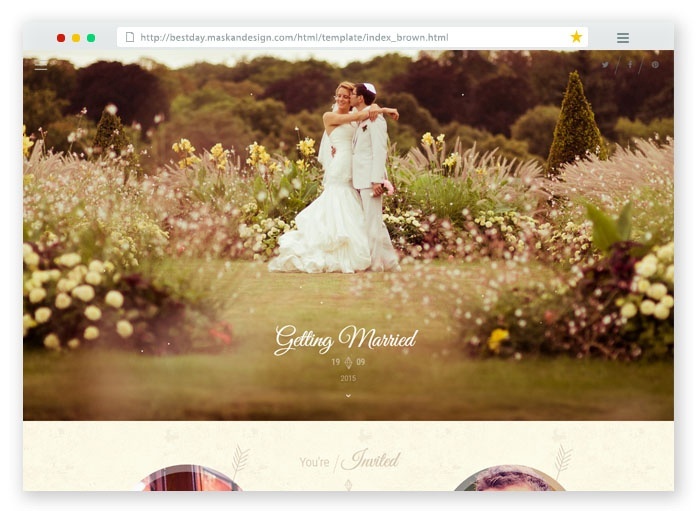 Generally used by a wedding photographer this is a responsive template to show photos through amazing photo gallery. It offers a range of variety in design and layout choices. This is a fully responsive HTML template with cool slider intros, masonry blog, Instagram feed support, retina display support, HTML5 & CSS3 standards etc. You have a superb collection of wedding templates. 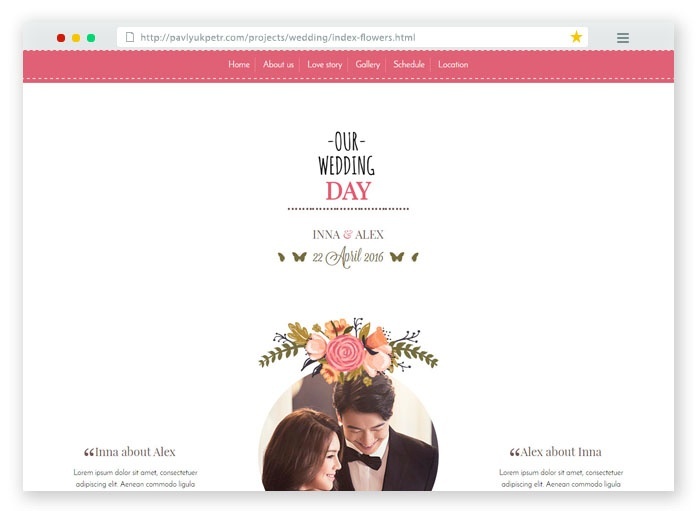 For more templates related to the wedding, you can check and put your special day on to a digital canvas.